When it showed up, I put it in a pot with detergent and cooked it on the office cooking range.... when nobody else was present to watch. Paint came off quickly, primer needed another Acetone bath. Now mulled over an appropriate paint scheme to make her suitable for the roster of the California Pacific. however I fainted when thinking about applying those pesky decals over the radiator detail on the hoods. the Cal-P has electrified lines operated in cooperation with the local trolley network so this makes sense. My favorite Orange paint, Floquil Daylight Orange, is long gone.... so I resorted to the substitute I found. 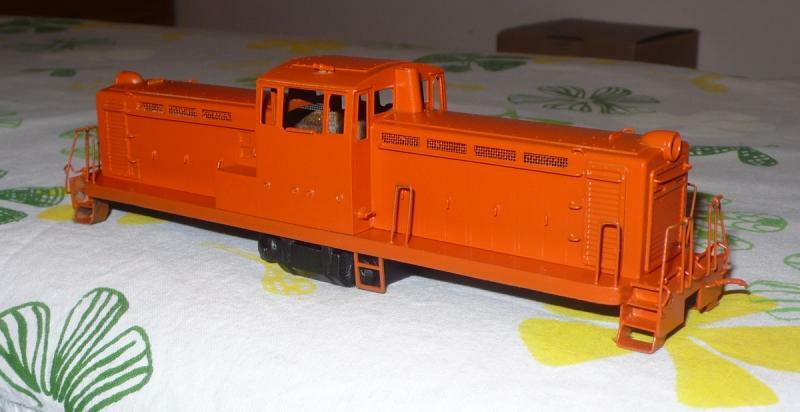 One part Revell glossy Orange #32130, one part Revell Ochre Brown #32188. 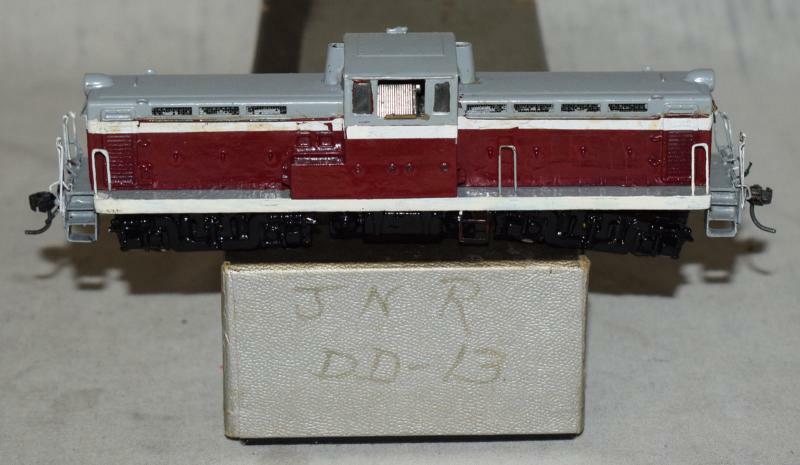 That gives a "new" look, if its desired to have a loco show its age it should be toned down with gray or more Ochre. Then, drilled through the solid brass headlight castings to insert 2mm LEDs. This proved to be a pitfall, as I had to discover later. Tenshodo motor worked ok but caused the motor to shut down after a few minutes, so installed a cheap Chinese can motor. Very little clearance under the hood! The big Tenshodo motor was partially concealed in the fuel tank. When running the loco in circles to check for bugs, I noticed a grinding noise that wasn't present at all times. Found that the top gear of the tower drive would touch the LED sticking out from the headlight casting! Ground away a little from the LED, no success! finally put washers under the truck bolsters to raise the complete frame + carbody marginally. haven't yet decided what to put on the hoods.
" ... cooked it on the office cooking range.... when nobody else was present ... "
I used to work with an engineer who made tea like you do ! ... & brass swarf doesn't dissolve in luke-warm water BTW ! But I do like eBay bargains, after some TLC & a jazzy re-paint ! 'California Pacific' orange is a very nice lookin' shade, if you ask me. Perfect for 'The Sunshine State' !